Unlicensed spectrum is the key to this massive undertaking by Google to provide internet access worldwide, including any place on earth – regardless of terrain or current broadband access. This is a remarkable experiment and one that could revolutionize both third world countries along with emerging markets by generating critical access to information and resources. CHRISTCHURCH, New Zealand (AP) — Wrinkled and skinny at first, the translucent, jellyfish-shaped balloons that Google released this week from a frozen field in the heart of New Zealand’s South Island hardened into shiny pumpkins as they rose into the blue winter skies above Lake Tekapo, passing the first big test of a lofty goal to get the entire planet online. It was the culmination of 18 months’ work on what Google calls Project Loon, in recognition of how wacky the idea may sound. Developed in the secretive X lab that came up with a driverless car and web-surfing eyeglasses, the flimsy helium-filled inflatables beam the Internet down to earth as they sail past on the wind. Still in their experimental stage, the balloons were the first of thousands that Google’s leaders eventually hope to launch 20 kilometers (12 miles) into the stratosphere in order to bridge the gaping digital divide between the world’s 4.8 billion unwired people and their 2.2 billion plugged-in counterparts. If successful, the technology might allow countries to leapfrog the expense of laying fiber cable, dramatically increasing Internet usage in places such as Africa and Southeast Asia. The first person to get Google Balloon Internet access this week was Charles Nimmo, a farmer and entrepreneur in the small town of Leeston. He found the experience a little bemusing after he was one of 50 locals who signed up to be a tester for a project that was so secret, no one would explain to them what was happening. Technicians came to the volunteers’ homes and attached to the outside walls bright red receivers the size of basketballs and resembling giant Google map pins. Nimmo got the Internet for about 15 minutes before the balloon transmitting it sailed on past. His first stop on the Web was to check out the weather because he wanted to find out if it was an optimal time for “crutching” his sheep, a term he explained to the technicians refers to removing the wool around sheep’s rear ends. Nimmo is among the many rural folk, even in developed countries, that can’t get broadband access. After ditching his dial-up four years ago in favor of satellite Internet service, he’s found himself stuck with bills that sometimes exceed $1,000 in a single month. While the concept is new, people have used balloons for communication, transportation and entertainment for centuries. In recent years, the military and aeronautical researchers have used tethered balloons to beam Internet signals back to bases on earth. 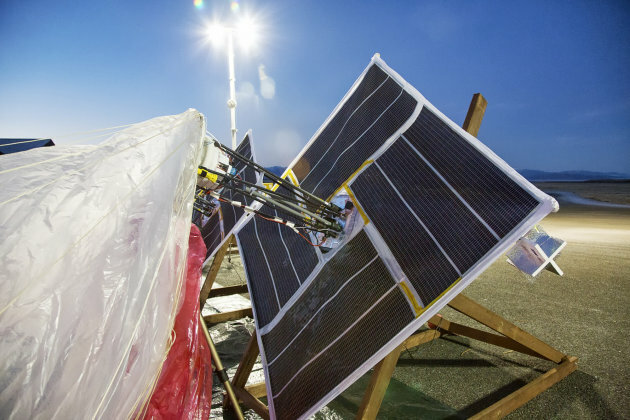 Google’s balloons fly free and out of eyesight, scavenging power from card table-sized solar panels that dangle below and gather enough charge in four hours to power them for a day as the balloons sail around the globe on the prevailing winds. Far below, ground stations with Internet capabilities about 100 kilometers (60 miles) apart bounce signals up to the balloons. The signals would hop forward, from one balloon to the next, along a backbone of up to five balloons. Each balloon would provide Internet service for an area twice the size of New York City, about 1,250 square kilometers (780 square miles), and terrain is not a challenge. They could stream Internet into Afghanistan’s steep and winding Khyber Pass or Yaounde, the capital of Cameroon, a country where the World Bank estimates four out of every 100 people are online. There are plenty of catches, including a requirement that anyone using Google Balloon Internet would need a receiver plugged into their computer in order to receive the signal. Google is not talking costs at this point, although they’re striving to make both the balloons and receivers as inexpensive as possible, dramatically less than laying cables. The signals travel in the unlicensed spectrum, which means Google doesn’t have to go through the onerous regulatory processes required for Internet providers using wireless communications networks or satellites. In New Zealand, the company worked with the Civil Aviation Authority on the trial. Google chose the country in part because of its remoteness. Cassidy said in the next phase of the trial they hope to get up to 300 balloons forming a ring on the 40th parallel south from New Zealand through Australia, Chile, Uruguay, Paraguay and Argentina. Christchurch was a symbolic launch site because some residents were cut off from online information for weeks following a 2011 earthquake that killed 185 people. Google believes balloon access could help places suffering natural disasters get quickly back online. Tania Gilchrist, a resident who signed up for the Google trial, feels lucky she lost her power for only about 10 hours on the day of the quake. At Google’s mission control in Christchurch this week, a team of jet lagged engineers working at eight large laptops used wind data from the National Oceanic and Atmospheric Administration to maneuver the balloons over snowy peaks, identifying the wind layer with the desired speed and direction and then adjusting balloons’ altitudes so they floated in that layer. “It’s a very fundamentally democratic thing that what links everyone together is the sky and the winds,” said Richard DeVaul, an MIT-trained scientist who founded Project Loon and helped develop Google Glass, hidden camera-equipped eyeglasses with a tiny computer display that responds to voice commands. DeVaul initially thought their biggest challenge would be establishing the radio links from earth to sky, but in the end, one of the most complex parts was hand building strong, light, durable balloons that could handle temperature and pressure swings in the stratosphere. Google engineers studied balloon science from NASA, the Defense Department and the Jet Propulsion Lab to design their own airships made of plastic films similar to grocery bags. Hundreds have been built so far. He said they wouldn’t interfere with aircraft because they fly well below satellites and twice as high as airplanes, and they downplayed concerns about surveillance, emphasizing that they would not carry cameras or any other extraneous equipment. The balloons would be guided to collection points and replaced periodically. In cases when they failed, a parachute would deploy. While there had been rumors, until now Google had refused to confirm the project. But there have been hints: In April, Google’s executive chairman tweeted “For every person online, there are two who are not. By the end of the decade, everyone on Earth will be connected,” prompting a flurry of speculative reports. And international aid groups have been pushing for more connectivity for more than a decade. In pilot projects, African farmers solved disease outbreaks after searching the Web, while in Bangladesh “online schools” bring teachers from Dhaka to children in remote classrooms through large screens and video conferencing. Many experts said the project has the potential to fast-forward developing nations into the digital age, possibly impacting far more people than the Google X lab’s first two projects: The glasses and a fleet of self-driving cars that have already logged hundreds of thousands of accident-free miles. “Whole segments of the population would reap enormous benefits, from social inclusion to educational and economic opportunities,” said DePauw University media studies professor Kevin Howley. Temple University communications professor Patrick Murphy warned of mixed consequences, pointing to China and Brazil where Internet service increased democratic principles, prompting social movements and uprisings, but also a surge in consumerism that has resulted in environmental and health problems. As the world’s largest advertising network, Google itself stands to expand its own empire by bringing Internet to the masses: More users means more potential Google searchers, which in turn give the company more chances to display their lucrative ads. Richard Bennett, a fellow with the nonprofit Information Technology and Innovation Foundation, was skeptical, noting that cell phones are being used far more in developing countries. Ken Murdoch, a chief information officer for the nonprofit Save the Children, said the service would be “a tremendous key enabler” during natural disasters and humanitarian crises, when infrastructure can be nonexistent or paralyzed. In Christchurch this week, the balloons were invisible in the sky except for an occasional glint, but people could see them if they happened to be in the remote countryside where they were launched or through binoculars, if they knew where to look. Before heading to New Zealand, Google spent a few months secretly launching between two and five flights a week in California’s central valley, prompting what Google’s scientists said were a handful of unusual reports on local media. For better or worse, MS doesn’t appear to be backing down in the least on its new Xbox One policy of forcing players to register their games online daily. While that seems a bit elitist and rude, the Xbox 360 isn’t going anywhere and still has new, exclusive games being developed for it. I guess eight year old consoles are still “state of the art”. If the 360 is still great, is that even less of a reason to move to the next gen Xbox One console? Amid the hoopla over the new One, an Xbox executive reminds people without Internet connectivity that the venerable 360 is still available. Bummed out because the Xbox One requires an Internet connection? Microsoft has some advice for you: stick with an Xbox 360. In an interview with Spike TV at the E3 show Tuesday, Xbox executive Don Mattrick responded to the complaints about the Xbox One’s demand for an Internet connection. Mattrick described the $499 Xbox One, coming in November, as “a future-proof choice,” saying that a console designed to be used online offers certain advantages, such as the ability to link games and entertainment. And for those people without Internet access? The interviewer then chimed in, saying “So stick with 360, that’s your message…?” To which Mattrick responded, “Well, if you have zero access to the Internet, that  is an offline device.” Citing one unusual example, the Xbox exec said he read a blog comment from someone who serves on a nuclear sub. Mattrick makes a valid point here. Sometimes you have to sacrifice backward compatibility to stretch the envelope with new products. And it’s not as if the Xbox 360 is going away. Microsoft has promised to continue to invest in its current console. On Tuesday, the company even launched a new Xbox 360 with a design mimicking that of the Xbox One. TLDR; Points is an internet-connected street sign that pulls data from social media and spins 360 degrees to aim in the direction of any location or event. In our increasingly connected world, isn’t it about time the humble street sign received a high-tech upgrade? That’s certainly the thinking behind Points, the newest project from Breakfast, a New York-based design group. Points is an internet-connected directional sign that pulls data from social media and spins its arms up to 360 degrees to aim in the direction of a location or event. At a glance, Points looks like any other directional sign, with three arrows pointing toward designated spots. Once a person makes a selection on the menu near its base though, the signs rotate toward the three nearest places that match the chosen criteria. At the same time, the LED displays on each one will change to show the name of the location along with pertinent information. For example, if someone selects “Transit,” the sign might point out the nearest subway stations or bus stops, along with an estimated walking distance and the next departure time for each one. Points connects to the internet via Wi-Fi or Ethernet to pull current information from a wide range of sources, including Twitter, Foursquare, RSS feeds, and transportation APIs. Using this data, the system can determine if any special events are happening nearby, find the most popular landmarks for tourists, or pick out the highest rated restaurants and stores in the area. No matter where it’s installed, Points adapts to its location to provide relevant directions and can be programmed to draw from other data sources if needed. The user menu can also change its selections appropriately throughout the day. In the morning, it might show options for “Breakfast” and “Coffee,” for example, but will display “Dinner” and “Drinks” in the evening. Points can even act as a rotating news ticker, showing current events and sports scores while turning toward the site of each game or news story. Breakfast spent over three years developing the concept into a reliable model that could blend in as a street sign while providing the most accurate directions possible. The final product measures 9 ft (2.7 m) tall, with 3 ft (0.9 m) arms at the top. According to the developers, about 90 percent of Points is built from aluminium, making it durable enough for different environments but still lightweight for transportation. The design team built a custom system of gears and motors that could fit inside a slim pole and provide smooth motion to each arm. The sign uses rotary electrical interfaces to move the arms 360 degrees in either direction without tangling any wires, while a 200 pulse per rotation quadrature encoder monitors its exact degree of rotation. Each sign contains an array of 16,000 LEDs to display locations and info, which is controlled by energy-efficient XMega processors. It’s pretty easy to picture some specific locations where a Points sign would come in handy. For example, aside from tourist hot spots, the system could be programmed for specific events, showing which bands are on stage at a music festival or where to find the next keynote at a conference. The designers at Breakfast are currently accepting orders to place Points at special events, provided the organizers can meet certain space and internet requirements. They’re also looking into making completely weather-proof models that could be installed permanently. For now though, anyone can visit the Points official website and send a tweet to a prototype to watch it spin toward their location in real-time. You can also check out the video below to see the rotating electronic street sign in action.